Unit framework is 69” square x 198” tall. Main frame constructed from 4” square x 1⁄4” wall structural tube with continuous welds. Dual 1-ton Harrington electric chain hoists with motorized trolleys and monorail system. Dual Spider-LiftTM bulk bag lifting frames. 304 stainless steel bulk bag support pan with welded tubular supports for operator safety. 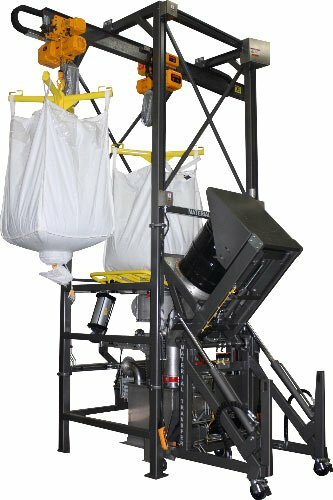 Flo-MasterTM bulk bag massaging system promotes positive material flow. 304 stainless steel Flo-LockTM slide gate system quickly halts material flow for partial bag discharge. 304 stainless steel Seal-MasterTM bag spout access chamber enables optimal operator access to bag discharge spout. 304 stainless steel Sure-SealTM pneumatic bag spout clamping system seals bag discharge spout to discharge transition for dust-tight discharge. 316 stainless steel product discharge transition with flexible connection to bag break station. Discharge transition includes an actuated slide gate. 316 stainless steel bag break station with dust take-off port, hinged bag dump port, and hinged drum discharge port. Unit features an integral Lift & SealTM Drum Discharger to allow introduction of drummed materials into downstream process. NEMA 4X operator control station with purge system. Modular design provides custom solutions at a reduced cost. Easy to install, and easy to upgrade or retrofit components as process requirements change. All units are custom designed to meet the customer’s specific application needs. Frame constructed with up to 78% more steel than other units for superior strength.